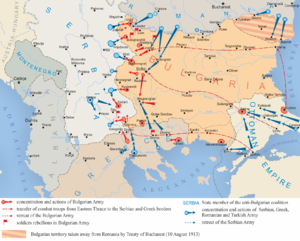 The Seicont Balkan War wis a conflict which broke oot when Bulgarie, dissatisfied wi its share o the spoils o the First Balkan War, attacked its umwhile allies, Serbie an Greece, on 16 (A.S.)/29 June 1913. ↑ 1.0 1.1 1.2 Hall (2000), p. 117. ↑ 4.0 4.1 Hall (2000), p. 135. ↑ Calculation (PDF) (in Greek), Hellenic Army General Staff, p. 12, retrieved 14 January 2010 . This page wis last eeditit on 7 Julie 2015, at 14:29.